While Facebook's sizable portfolio contains some major assets - be it photo-sharing service Instagram or messaging giant WhatsApp - the social media firm likes to keep a hands-off approach with its acquisitions. That couldn't be further from the case today, as a legal dispute between game publisher ZeniMax and the Facebook-owned virtual reality company Oculus has roped in none other than Mark Zuckerberg. The Facebook founder and CEO was in federal court in Dallas today to testify in the row, in which ZeniMax accuses Oculus of stealing technology back in 2014 that would ultimately appear in the Oculus Rift. ZeniMax is suing Oculus for a whopping $2 billion in damages. ZeniMax, best known for publishing games like the Elder Scrolls series and last year's DOOM, claims then-employee and id Software genius John Carmack shared the company's proprietary VR technology with Oculus' co-creator Palmer Luckey before leaving to work for Oculus himself. 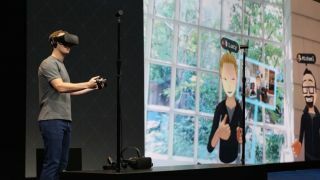 Zuckerberg testified no plagiarism was used in the development of Rift, stating Facebook is "highly confident that Oculus products are built on Oculus technology," and that "the idea that Oculus products are based on someone else’s technology is just wrong," as reported by The New York Times. In addition to questioning the Oculus Rift's originality, ZeniMax's lawyer Toni Sammi also contested Facebook's $2.3 billion purchase of Oculus two-and-a-half years ago, putting into question why the company didn't heed ZeniMax's legal warnings. According to evidence presented during today's portion of the trial, Facebook appears to have only conducted a weekend's worth of legal diligence on Oculus before making the purchase - an length of time Sammi claims isn't even enough to do a routine house inspection, let alone a proper vetting of a company's ongoing liabilities, according to Gizmodo. Should the court find Oculus - and by extent, Facebook - guilty of stealing technology for the Rift, it could not only mean a massive payout worth almost as much as Oculus itself, but also severely hamper Facebook's plans for VR, a sector Zuckerberg is hellbent on leading. Zuckerberg made sure not to exit the stand without leaving behind a piece of his mind, however. In regards to ZeniMax's allegations, he said that big purchases like the one for Oculus make "all kinds of people just kind of come out of the woodwork and claim that they just own some portion of the deal,” adding that he had not even heard of ZeniMax before the lawsuit. Oculus Rift vs HTC Vive: Which headset is better?